Tina Hackett follows the travels of one prehistoric space kid courtesy of Ocean's new platformer, Kid Chaos. Grudgingly, I put the disk into the drive dreading yet another dull platformer. But pushing all my reviewer's cynicism to one side though, I pledged to give it a fair trial. And then a strange thing happened. I was actually having fun. In fact it's the only thing that's brought a smile to my post-holiday depressed face all week! Granted, Kid Chaos is another platformer, but Wales-based software house, Magnetic fields, have really done something to add sparkle to a tired-out formula. Hmm, a bit dodgy this one but here goes. Kid Chaos, a cave-kid, was kidnapped by evil scientists from the future and transported back to the 21st Century. They experimented on him and forced him to wear modern clothes - this being the most contrived excuse for his dubious choice in clothing I've ever heard. The kid, having somewhat of an aversion to being experimented on and having to wear blue slacks, decides to escape. However, the exits are blocked by force fields but the kid overhears the scientists talking - in true blockbuster movie fashion - and hurrah, by smashing enough scenery this breaks the sources of the force field and unblocks the exits. He escapes and now it's your job to guide him home. The story of Kid Chaos relies on the futuristic image that man will be able to travel backwards and forwards in time (i.e. scientists from the 21st century travel back to the stone age to kidnap Kid Chaos). Many theories have been pushed forward on the subject, making it a topic rich in opportunity to stretch the imagination. With many explorations into space having been made, things that didn't even seem vague possibilities are now reality. Those born at the turn of the century would have merely laughed at the thought of sending one man and his dog into space, but then in 1957 the first dog was sent orbiting around the Earth to determine the effect of weightlessness on animals. And only a few years later we witnessed the first man landing on the moon. So, what may seem bizarre of impossible to use now may well become a distinct possibility in the future. In the meantime though, people can only speculate, and images of time travel can still conjure the imagination without the restrictions of reality. Take your pick really. There are enough platformers to look back on and compare. Well, I'll start with Zool, the game whichs ets the standards for other Amiga platformers to follow. It's a hard act to match but Kid Chaos does come pretty close, although Zool plays a little faster than Kid Chaos and looks slightly prettier as well. 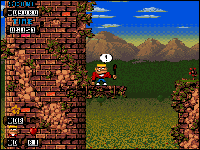 Unlike most platformers though, Kid Chaos is not cute. In fact this is where it drives a great deal of its appeal. Instead of rescuing sweet fluffy bunnies you actually get to beat them out of the way with a club. And instead of having to play an annoyingly cute spite you get to play a Billy Idol look-a-like with an attitude for smashing the place up with a baseball bat. Yet again brilliant. The fast dance track works well with the style of the game and it even becomes realistically muffled when the character appears under water. Sound effects such as when Kid Chaos smashes the scenery works well and give a great feeling of a real smash-'em-up fest! It probably makes a pleasant change but I'm actually stuck for words. The graphics are really breathtaking and it's hard to sum them up well enough to do them justice. Layers upon layers of parallax scrolling have been used to create a terrific sense of realism and depth, and updates at the most terrific rate to keep up with the action. Consoles can disappear up their own cartridge holes because as far as I'm concerned this looks as good, if not better than some supposedly superior console platformers. There are many different settings, from Secret Gardens to Toxic Wastelands, and each one looks superb, picking up on a bright, cartoon-like feel. Platformers have acquired somewhat of a reputation of late for unoriginality and it's great to see a game that really does break the mould. Kid Chaos thankfully lacks any cutesy factors. It's fabulous to play, looks great and the end-of-level games - wow! The idea behind them is a sort of shoot-'em-up scenario and armed with a gun you have to clear the screen of various objects. On one level you even get to blast cute teddy bears. See, no sympathy for small, furry creatures and it's great! 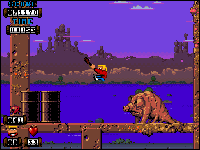 The gameplay, although following the basic principles of platformers, adds a novel twist in destroying the scenery and cute animals. Although it may not be politically correct, it means you get to keep your lunch down rather than these sickeningly sweet offerings we get these days. And just because it's a platformer doesn't mean life is going to be easy. Far from it in fact. It'll take some tricky joystick manoeuvring in some places, which may prove irritating from some but this is also an advantage in that the game will last and last, making it well worth the asking price. When a small child is driven cruelly from his Stone Age homeland to an Artificial Environment Centre sometime in the future, his socialisation process is likely to be affected. Not for him a trouble free upbringing of cheese cloth shits, Screen Test and camping holidays in the South of England. No siree. This kid is gonna have a whole load of readjustment problems. And as luck would have it, I'm not talking utter nonsense (well, I am) because Kid Chaos has found himself in exactly this situation. Sporting an outfit which would have done an extra from West Side Story proud, Kid Chaos wants out of the modern world. To get back to his prehistoric paradise he must batter his way through five worlds of platform action. This is no cutesy affair; the Kid has a club which he can swing indiscriminately, crushing everything in his path. He can spin and knock everything out of the way and... oh, I can't go on with this. Kid Chaos is Sonic The Hedgehog - replace the blue spiky thing with Kirk Brandon from popular Eighties rock combo Spear of Destiny, bring to the boil and simmer. A recipe for success or half-baked nonsense? Anyway, each world is split into four levels, some huge, some short but devilishly tricky, concluding with a classic-style arcade game at the end of each world, including a Breakout and a Space Invaders clone. And my, they are splendid fun. But what of the meat? The worlds themselves aren't wildly original - but then you could say that about most platform fare. They range from Toy and Techno lands to Ruined Cities and Toxic Wastelands. No, what you get is speed - if you feel the need. Kid Chaos is one of the quickest fellows around - you bound along taking out the nasties and the power pods a toute vitesse, as they say somewhere abroad. It's darned tricky though. At the end of each level you're informed of the damage done and as often as not only 50-60 per cent has been completed. And the task times differ greatly - on one level you may have 15 minutes to bob around while on the next it could be only 90 seconds, which means collecting as much time as possible, and it can be frustrating, particularly when the exit is elusive. Some of the manoeuvring is very tricky, and you're often caught between grabbing the pick-ups, carefully avoiding the many traps and just bombing along hoping everything will be all right. But Kid Chaos is a pretty comprehensive platformer. The worlds are varied enough to sustain interest and the parallax scrolling is smoothly efficient, though whether you need another platform game like this is another question. But enough. The bottom line - Kid Chaos is fun. And that's what counts. Batter the balls to break the walls. Blow away those nine speeding barrels. Hit the teddies and avoid the ducks. Er... Wonder what you're supposed to do here? Watch out for the spikes and shatter the ceiling. Smooth parallax scrolling, a pleasantly thuggish sprite and detailed animation. You can turn off the music and have only the FX - as they say. And we like that. Not frighteningly addictive, but you just can't wait to get to those end of world sub-games. Controlling the Kid can be fiddly at times, particularly because the game is so speedy. Kid Chaos is super Sonic, gin and tonic - wildly frustrating, yet in parts addictive. The chances are you've played it like before but KC is well-executed platform fare. Ein Überraschungsei von Ocean: Aus dem sonst eher durchschnittlichen Plattform-Angebot der Engländer hüpft plötzlich ein prähistorischer Bengel mit flotten Steinzeit-Keilereien in die erste Riege der Jump & Runs! Kaum hat der kleine Jurassic-Rowdy das Licht der Welt erblickt, das bricht auch schon Hektik aus: Neugierige Wissenschaftler entführen den Knirps aus seiner kuscheligen Fred-Feuerstein-Umgebung ins 21. Jahrhundert, wo er gar nicht froh darüber ist, zukünftig den Job einer Laborratte zu übernehmen. Ehrensache, daß man da zum Joystick greift, um den Knaben heim zu seinen urigen Mami zu geleiten - die Zeitmaschine wartet am Ende von ünf abschnittweise unterteilten und mit einem Zeitlimit gesegneten Levels. Lediglich mit einer ollen Keule bewaffnet, köpft Brorks Urahn in der ersten Stufe noch harmlos mutierte Blumen im Wald und auf der Wiese, während es vermeintlich nette Häschen und Fledermäuschen auf seinen Energievorrat abgesehen haben. Nach dem gegnerlosen Levelfinale mit "Arkanoid"-Mauer kurvt er dann um ätzende Giftpfützen in einer ausrangierten Chemiefabrik und haut den ansässigen Riesenschlangen sein Stöckchen aufs Haupt. Ist auch diese Aufgabe bewältigt, wollen in der Spielzeugfabrik "entgegenkommende" Matchboxautos plattgemacht werden, ehe in Techno-Town noch diverse Fahrten auf Tempo-Achterbahnen zu absolvieren und in einer Tempel-Stadt die Maikäfer der Zukunft zu besiegen sind. Alle diese Szenarien gliedern sich in jeweils drei Plattformabschnitte plus einem finalen Zusatzspiel wie dem erwähnten "Breakout"-Verschnitt, kleinen Ballereien oder ähnlichem. Mit Magnetic Fields alias Shaun Southern und Andrew Morris zeichnet jenes Programmierteam für Kid Chaos verantwortlich, das bereits mit den diversen "Lotus"-Games (für Gremlin) eine ganze Klassiker-Trilogie vorzuweisen hat. Bei solchen Voraussetzungen braucht sich natürlich niemand zu wundern, wenn es hier so schnell spielbar und teilweise auch technisch brillant zugeht wie sonst selten im Genre. Noch weniger verwunderlich ist das, wenn man weiß, daß statt echter Innovationen eine ausgereifte Sammlung alt-bewährter Hops-Ideen wartet - also etwa Sammelextras für frische Lebensenergie, Schutzschilde oder schnelle Spurtstiefel sowie Rücksetzpunkte für den kürzlich verblichenen Neandertaler. Aber selbst wenn die gebotenen Ideen nicht gerade taufrisch sind, hier macht's einfach die Masse. So muß der Spieler mit Geheimkammern, Höhlenpassagen und superschnellen Sprints genauso fertig werden wie mit millimetergenauer Pixelarbeit. Das hohe Spieltempo wird allenfalls durch im Weg stehende Stacheln oder baumelnde Morgensterne abgebremst, und auch bei beweglichen Plattformen, Lasern oder Flammenwerfern schaltet man natürlich besser einen Gang runter. Die besonders effektiven Sprungfedern dagegen müssen mit Vollgas angespurtet werden und sorgen dann für so viel Speed, daß höchstens noch "Zool" oder "Mr Nutz" mithalten kann. Für Einsteiger ist der prähistorische Runner aber eher nicht gedacht, denn die mannigfaltigen Gefahren und zunehmend unfairen Attacken werden trotz der hervorragenden Steuerung wohl nur Plattform-Profis meistern können - aber wer ist das heutzutage nicht? Die Handhabung hat ein Extralob verdient: lästige Kopierschutzmechanismen fehlen, und die Nachladepausen fällen freulich kurz aus. Und als Clou erlauben die Ozeanisten erstmals, ein Actiongame auf Festplatte zu nageln - mit 1,5 MB RAM seid Ihr dabei. Ja, man kann sogar zwischen einer gepackten und einer speicherplatzfressenden, dafür aber schnelleren Expanded-Version wählen. Im Optionsmenü darf man die Steuerung konfigurieren, Level-codes wahlweise per Tastatur oder Stick eingeben und das Vorhandensein sowie die Lautstärke der Begleitmusik (vielfältige und überwiegend gute Techno-Tracks) bzw. Sound-FX regeln. Im Spiel wird übrigens fast jede Aktion von passenden Effekten begleitet, und gelegentlich künden lauter werdende Geräusche von Gefahr im Anzug, was man recht bald zu schätzen lernt. Die Grafik fährt allerdings auch ein paar Negativpunkte ein, denn manche Sprites sind geradezu lachhaft animiert und wollen so gar nicht zu derart detailreich ausgearbeiteten Hintergründen wie etwa einem plätschernden Wasserfall mit Brücke, die sich bei Betreten gefährlich durchbiegt, passen. Und wo sich Blümchen nett in der Kulisse drehen, fallen vernachlässigte Käfer halt doppelt unangenehm auf: Da flattert nichts, die Krabbeltiere sausen völlig unbewegt durch die Luft. Einige Szenen kommen sogar fast im SW-Look daher, und speziell den Chemielevel könnte direkt ein Farbenblinder entworfen haben. Viel hat zum Hit also nicht gefehlt - ein bißchen mehr optische Feinarbeit und ein paar Innovationen beim Gameplay, und wir hätten sofort und ohne Zögern unser Gütesiegel gezückt. What would you do if you were catapulted forward thousands of years? Phew. Good job we held off reviewing Kid Chaos until it had been completely finished and had had its name finalised, eh? Otherwise we might have done something embarrassing like writing 'Kid Vicious' on our cover. But anyway. Nomenclature confusion aside, Kid Chaos looked decidedly impressive when Ocean first showed it to us last month. Developers Magnetic Fields really did seem to have got to the bottom of what makes a good platform game. Kid Chaos did not just scroll really fast - heck, a game could scroll from one side of the playing area to the other in 0.25 seconds without necessarily being any fun - but it made use of that speed by sending you flying joyously through conveniently-placed lines of collectables, hurling you miles up into the air and flinging you from bumper to bumper in pure rapture. And on top of that it was full of original thinking, like having little Duck Shoot and Breakout games at the end of levels. Magnetic Fields genuinely seemed to know what they were doing. So it came as something of a surprise when I jumped down a shaft near the end of level 3 and got killed by some spikes. There were not any spikes at the bottom of the last two shafts I'd jumped down. I had no way of knowing there'd be some at the bottom of this one. I put my head in my hands and wept, realising for the first time that Kid Chaos is, in fact, no different. It is just like all the others. And as it turns out, Kid Chaos is a game of extremes. On the one hand there are the brilliant, truly inspired features like the spiky balls which make stereophonic swooshing noises as they swing from side to side (once you have turned off the ill-advised rave soundtrack), and the way your power level gradually rises if you stand still, so you can trade time for energy, or the little room in the Toy Factory where you have got to bash into rows of Space Invader-shaped baddies. And on the other hand there are pointless, brainless things like barrels which suddenly come rolling towards you giving you no chance of avoiding them unless you are expecting them, and bumpers which send you flying backwards into spiky pits, and spikes which blend into the background so well that, although you can just about make them out while you are standing still, you have no chance of spotting them when the screen is scrolling, and - perhaps most witless of all - orange bubbles which inexplicably appear directly on top of your sprite and kill him. It is a bizarre kind of Jekyll and Hyde-type situation, good versus evil, and at the moment I am not exactly sure which side triumphs. Going back to the good things, the settings make a refreshing change. You will find no slippy-slidey ice worlds or runaway mine-carts. Instead there are neat ideas like the Toy Factory where all the toys are running amok, and the pollution-ridden Toxic Wasteland, even if it does start off in a garden. The graphics are generally all right as well, if a bit muddily-coloured. The levels are about the right length, and each one has got a different emphasis, whether it is having to make your way carefully through a particularly trickly-placed series of platforms, having to hunt around for thinly spread Smashable Things (which you have got to hit a certain number of to open each level's exit), or simply having to race to the end against a particularly tight time limit. This, along with the amusing end-of-level bits, makes for a game containing plenty of variety. But what about the momentum on Kid himself? It is a real effort to get him moving, and just as tough to get him to stop again, which means he is constantly blundering into baddies, sliding off platforms and not being able to make it off collapsing platforms. And he is hardly the most identifiable-with of characters - a caveman in Zany Cool Sneakers who I was rarely sorry to see plunging to his death. Cute woodland animals might be cliched, but they do at least appeal to the protective instinct in us all. 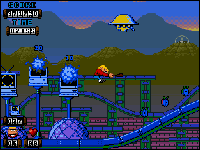 Kid Chaos has got lovely bits where you go whizzing along winding pipes and burst joyfully out of the end, and then completely stupid bits where you have got to tip-toe between closely-placed crushers, only cannot possibly make it through because the controls are so sluggish. It sends you bouncing in exhilarating zig-zags between carefully placed bumpers, but then puts an electric force field at the end that you go flying towards and die. It recognises a second disk drive, but then draws a huge picture of a disk on the screen and writes "Please insert disk 2" when disk 2 is already there. AND THERE IS A POWER-UP THAT REVERSES YOUR CONTROLS. I desperately wanted Kid Chaos to be a great game and, on balance, I think I like it quite a bit more than I hate it. But is is almost as if Magnetic Fields spent months writing this beautifully platform game, fine-tuning it down to the very last detail, and then left it on the kitchen table overnight ready to post off to Ocean the next day, whereupon some mischievous mice crept in and inserted a load of completely ridiculous flaws into it in a sort of reverse Tailor of Gloucester scenario. And yes, it does look like Sonic. UPPERS Does not just half-heartedly mimic Sonic, but manages to capture all the best bits of it. In places it is truly uplifting as you get sucked along pipes and thrown from bumper to bumper. The graphics are consistently good, and the sound effects are pretty spicy too. There is a thoughtfully-implemented password system. And above all it is varied, getting more and more complex the further you get. DOWNERS But there are enough classic blunders to keep Kangaroo Court going for months. Spitefully-placed spikes, obstacles you cannot avoid unless you memorise the entire game's layout, sluggish controls and restart points directly in the path of deadly laser bolts conspire to make it intensely frustrating. Kid Chaos could have been something really special, but is relegated to mere 'Well worth a look' status by a catalogue of ludicrous flaws. If you buy it, be prepared to explain your bloodcurdling howls of exasperation to the neighbours. Looks the same on the A1200. There is a CD32 version, though, if that helps, which outrageously costs £2 more and features marginally improved graphics and sound. So Sonic can't be done on the Amiga, eh? Since Sonic appeared on the Mega Drive it's been the bone of contention for Amiga kids, jeered at in school playgrounds by smug Mega Drive-owning peers. And seemingly every time an Amiga is mentioned in a Mega Drive magazine it's described as an 'older person's machine, with a great line in RPGs and flight sims, but no great shakes in the platform stakes'. Kid Chaos, from Lotus creators Magnetic Fields, wields a pretty hefty club in the direction of these doubters. Technically superior to any other platform game (Sonic included) Kid combines fast, smooth-scrolling, an incredible number of parallax layers, and colors and sounds so vibrant it makes you wonder what the hell the other platform creators have been doing for the last few years. Like all good arcade games there is a plot, or at least some cobbled-together guff which passes for one. It seem that a young, carefree, happy-go-lucky caveman was out hunting dinosaurs when POW! A pair of crazy scientists (from the future, naturally) whip him, and his club, to a modern-day garden suburb. Quite why they did this is unknown and, quite frankly, as immaterial as the whole story, but it's made even more confusing by the additional wardrobe of trousers, jacket and trainers that accompanied the quantum leap through time. Okay, so the storyline stinks. That established, we can now concentrate on the game which is, thankfully, much better. Five worlds lie between Kid and his goal: Secret Garden, Toxic Wasteland, Toy Factory, Techno Fortress and Ruined City. In terms of running, jumping, bashing and collecting they're very similar, but each world is both different and remarkable in its graphical style. The Secret Garden, for example, is packed with colorful flowers, beautiful greenery and wildlife, but no concession has been made to the fast pace and smoothness of the game. Not since Thalion's Lionheart have we been treated to so many layers of parallax, but that game was pedestrian in comparison - when the Kid gets going he really moves. Kid, still armed with his dinosaur-braining club, sets out to find the time machine, which could return him to his prehistoric home and, along the way, collect enough energy to actually power the sting. Sadly, the 'energy' in this case is stored in various disguises: flowers, stone monuments and lamp shades, to name but three, which must be destroyed in order to gather their electrical content. There's a certain amount which must be collected in each level before moving on to the next, so it's not just a case of racing through to the finishing post - you have to work to make that exit door open. From the beginning it's clear that Kid Chaos has been written with the player in mind. The controls can be changed, a throwback from the old Commodore 64 and Spectrum games, which is all too often lost on the Amiga. Now you can either push the button or move the joystick up to jump, both of which suit different people and if you're controlling with a joypad (CD32, for example) 'up to jump' strikes dread into the heart of players who, like me, put playability above everything else. But Magnetic Fields are veterans now, having produced some of the better games in recent times: Kickstart on the C64, Super Sprint on the ST and, more recently, the Lotus Turbo trilogy for Gremlin. So perhaps they should now best. When you complete a level you're given a complete run-down of your achievements. The amount of energy collected and baddies clubbed are highlighted, Chaos Engine-style, as small horizontal tubes which form a kind of bar graph charting your progress. So, if you've missed a few nasties, or you think you could have done better in the energy department, then you can always go back and try again. It's this kind of attention-to-detail which makes Kid Chaos a game you'll keep coming back to. And, of course, a platform game wouldn't be complete without its pickups. Apples, sweets, rocks, whatever, each one collected adds to your hit points (the number of times you can be hit by a baddie without losing a life). Each successive level has baddies with greater hit points, so while on World One Level One you might lose, say, 30 hit points, by the time you get up to World Three Level Three you'll probably lose 50. And since you start the game with 50, make it a priority to acquire those pickups as soon as you can. Thankfully, as you've probably gathered by now, the stunning technicalities don't overshadow the gameplay. It makes no claim to be original; indeed, it copies (parodies?) many other games like Zool and Sonic. The Toy Factory, say, could be directly taken from Zool (or any one of a number of other platform games), while the underground rollercoaster tubes and 45 degree springs which cannon you into the air are classic Sonic features. There is something wrong with Kid Chaos, though, believe it or not. This one real flaw is in the weight of the main sprite - he carries far too much momentum, which makes it very difficult to stop on some of the smaller platforms. And inertia plays havoc with the Kid when you're trying to move him up a hill: he really drags and grates his way up, which means it's a good second or so before you can make it to top speed. Because the worlds in Chaos are particularly hilly and packed with tiny little platforms, it seems ludicrous that the designers expect you to judge pinpoint distances with a control system that feels like lumpy porridge. Like I said, when he gets going, though, he really moves - and its this exhilarating speed that really makes up for the lack of control in the tighter areas. It stands, then, as a slightly flawed gemstone. A pick-up-and-play game which doesn't get too difficult too quickly, which looks and sounds brilliant, which poses a decent challenge to those who have already killed off Zool and the others, but which is slightly frustrating because of the massive momentum of the main sprite. 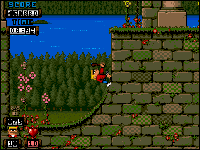 Compared with the scale of the game this is perhaps being picky, but I really feel that Kid Chaos could have been one of the greatest platformers ever if the Kid himself was just a wee bit more maneuverable. Breakout's the theme in the Garden. Using your club instead of a bat, you can scoop up the three balls and whack them up at the bricks to knock them out. Er... not quite a coin-op, but a shoot 'em up nonetheless. As the rocks fall, shoot them, and destroy all the barrels of toxic waste as well but they speed up, so watch out. Shoot a teddy, and a duck replaces it. Shoot the duck, and the teddy reappears. So, the aim is to kill all the teddies (shame), and leave the ducks well alone. Space Invaders, Chaos-style. We're talking real arcade stuff here, and it's even got all the sound effects and everyting! Just like Toxic Wasteland, this isn't based on a coin-op either. Never mind, shoot the pillars and posts until the crumble and fall. At last, the Amiga has a platformer to compete with the consoles. Wie hätte der allseits beliebte Holland-Rudi gesagt? Gerade noch im Disketten-schacht, jetzt schon auf der CD-Bühne: Oceans Plattform-Chaot bringt wenig Neues, aber viel Gutes für amiganisierte Silberhüpfer. Da seit der Floppy-Version nur wenige Wochen verstrichen sind, lassen sich die Unterschiede an drei Fingern abzählen: Die Steuerung wurde an das Joypad angepaßt, die Optik um ein, zwei Winzigkeiten ergänzt und die Techno-Musik auf CD kopiert - Ende Gelände. Die spielerische Praxis ist also von gewohnter Güte, denn selten ist ein Plattformheld mit mehr Tempo über den Amiga geturnt. Mit einer Keule bewaffnet gilt es, fünf in Abschnitte unterteilte Levels zu durcheilen, sich gegen Vögel, Matchbox-Autos, Mutantensäue und anderes Getier durchzusetzen und sich am Ende jeder Welt einer speziellen Herausforderung in Form von Breakout- oder Invader-Spielchen zu stellen. Dabei treibt ein Zeitlimit zur Eile an, zugleich sorgen Sprintpassagen, Sprungfedern, bewegliche Plattformen, Geheimkammern und tödliche Morgenstern-Pendel für Abwechslung im Gameplay - und einen Schwierigkeitsgrad, der selbst geübte Hüpfdohlen herausfordert. Und das, obwohl der Held einige Fehlsprünge bzw. Treffer wegsteckt und im Todesfall am zuletzt besuchten Rücksetztpunkt wiederbelebt wird. Doch die gelungene Optik entschädigt für viele Mühen: Das turboschnelle Parallax-scrolling fördert kunterbunte und meist gelungen animierte Fabrik-, Wald- und Tempel-Landschaften zutage; lediglich ein paar Stellen wirken langweilig, zumal sie auch mit den Bewegungen der Sprites knausern.